We are formed in love, grounded in love, consecrated in love. In God, we live and move and have our being…think about that… if God is that in which we live and move and have our being, and God is love, that means that love is that in which we live and move and have our being. It’s also true that that is another way of describing reality. That in which we live and move and have our being is…reality. Which means not only that God is real, but that God is reality which means love is reality. We live and move and have our being in reality which is love…which is God. When Paul starts in today on this famous passage—heard at virtually every wedding—this is the love he’s talking about. He’s not talking about romantic love, or the committed love between two partners—sure those are great goals to aspire to in relationships, being patient and kind, and not envious or boastful, but…—Paul is not addressing two people “in love” about to get married…he’s talking to a community about to tear itself apart over who’s right and who’s wrong—who’s in and who’s out. This new community in Cornith is fighting over different charismatic leaders (There’s a group claiming, “I belong to Apollos”, and another claiming, “I belong to Peter,” and another, “I belong to Paul.” And they’ve written to Paul saying, “help”. 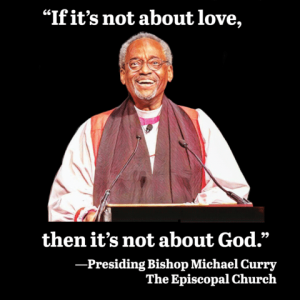 He gives them the metaphor of the body we heard last week—we’re all in this together..the foot can’t say to the eye, I have no need of you…—and continues by reminding them (again) that…”if it’s not about love, it’s not about God.” God is the source and the culmination of all of this…It’s all grounded in love. If I speak in the tongues of mortals and angels, but do not have love, I’m just making noise.” And then he expands on this and talks about the kind of love that we are all grounded in. …The love we are are created in…the love we live and move and have our being in…and if that’s true…then why doesn’t it feel like that all the time? What happens that makes us forget that…makes us feel like love is absent…or not around…makes us feel like reality and love and God have nothing to do with one another? There is no simple answer to that, but we get a stunning example of it happening in the Gospel today. Jesus reads from Isaiah (it’s actually a few different quotes from Isaiah)—“The spirit of the lord is upon me to proclaim release to the captives, good news to the poor, etc.” and then says, “Today, this scripture has been fulfilled.” And everyone is amazed. Then something happens that continues to confound us. Jesus refuses to do any healing in his hometown—can you imagine? He refuses to extend the messianic blessing to those closest to him. And instead, says he’s going to the foreigners (the Gentiles) over there across the border. And upsets people. Sure, go to the Gentiles, fine— but why are you refusing to share with us? That’s not fair.